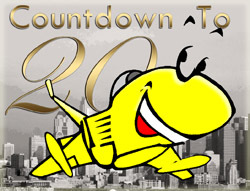 Seattle’s innovative improv comedy company, Wing-It Productions, home of Jet City Improv, will host “Laugh for the Future”, their 20th anniversary bash this Saturday at Hotel Deca in the U-District. Featuring free beer, wine, hors d’ourves and entertainment by the Jet City player, the troupe will look at the past 20 years and look forward to the next 20. The troupe’s social media currently features “blasts from the past” – video, photos and stories from the last 20 years. One of the company’s best-known shows is The Lost Folio, a fully-realized, entirely improvised five-act Shakespearean play. Folio audiences choose whether they want to see a comedy or a tragedy, then endow the main characters with their various tragic flaws and characteristics, and then the actors get to work, improvising in full Elizabethan dialogue in the style of The Baird. The anniversary bash will be followed by a performance at the company’s U-District theatre. On Sunday evening, alumni of the company will host a special performance. Tickets are $30 general admission, and $50 for the Super Donor ticket. Doors open and silent auction begins at 7:30. Jet City Improv offers a variety of classes for all levels of interest and experience, including an eight-week series in Kirkland. For more information, visit www.jetcityimprov.com.